Download PDF here (3 MB). We received several emails that some QSOs which are OK in Clublog are not confirmed in LoTW. So far in all the investigated cases the reason was that QSO data was not correctly uploaded to LoTW by the other side (by you or your logging program). Either QSO was missing at all in LoTW, or callsign was misspelled, or time was wrong. For this reason, if you find that some QSO confirmation is missing in LoTW, while Clublog shows that QSO is fine, before asking us to check what's wrong, please check on your side, if you see the missing QSO in your LoTW account. To do this, login to LoTW website. Click "Your QSOs". Enter 3C0L or 3C1L in "Call sign worked" field, click "Submit" button (not "Most recent QSLs" button), and check if you see the missing QSO with correct band, mode, date and time. It should be visible there even if we wouldn't upload anything at all to LoTW from our side. If you don't see the QSO on your side, or band/mode/date/time is wrong, resubmit the missing QSO with correct data to LoTW. We uploaded to LoTW all QSOs at once the same as you see them in Clublog, so it is unlikely that specific QSO data is not uploaded from our side. Full LoTW upload was done this morning. Merry Christmas! The 3C0L and 3C1L paperwork has been approved for DXCC credit. 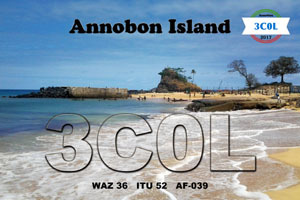 QSL cards are in printing. Soon QSLs for direct OQRS and sponsor QSOs will be mailed. On 10th of December also priority LoTW upload will be done for sponsor and direct OQRS QSOs. 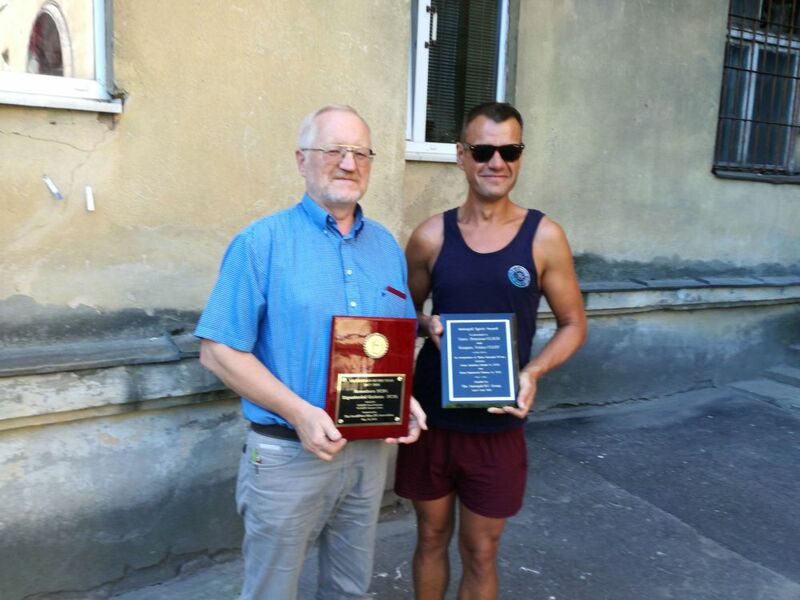 Yuris and Kaspars successfully returned home last night. The last part of 3C1L log was uploaded yesterday from Madrid airport. Some elections are ongoing again today. Everything is closed, including Internet cafe. So, no log upload tonight. Surprise, surprise: flight home is delayed to November 13 evening. Operation is over. 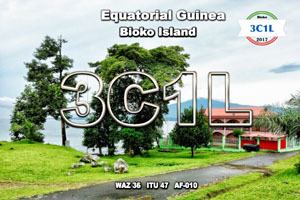 3C1L is QRT since November 12 05:01 GMT. Around 42 000 43 613 QSOs made it into 3C1L log during roughly 16 days of on-the-air time. Plus 32 447 QSOs in 3C0L log in 12 days on the air. Yuris will upload the last part of 3C1L log today in the evening when in Malabo. Their flight home is on November 13 morning. IK0OPS replied. 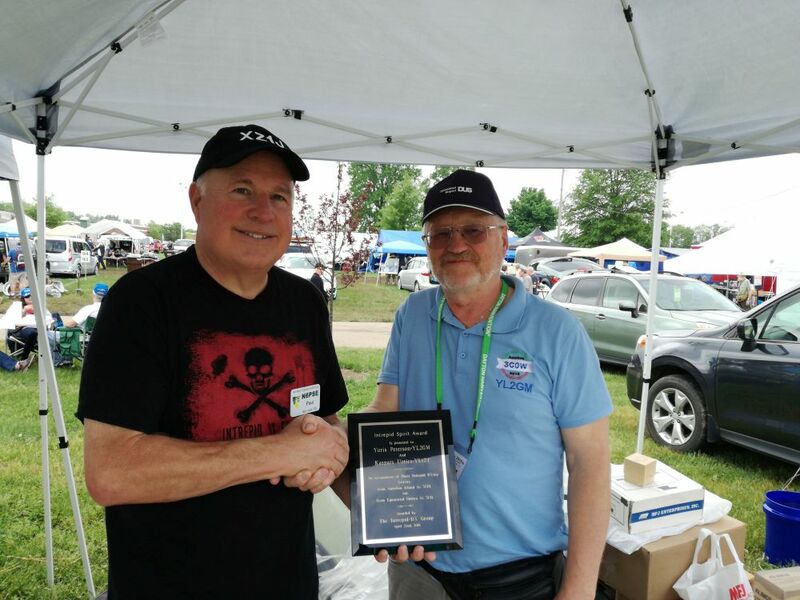 In short, he justifies dupe QSOs with the late uploads of our logs and uncertainty of success of the QSOs. Suggests us involving sattelite Internet to upload logs in "professional" manner. And says he would involve lawyers if we don't remove the post mentioning him, because now he receives angry emails from other HAMs. Our public reply: Dear all, please do not insult anyone. Dear IK0OPS: as we have written on October 15, you (and others) should not call us if you don't hear us. Confirmation of successful 2-way QSO should be heard on the airwaves, instead of relying on (near) real-time log on the Internet. Which is nice to have, but in no way mandatory and primary goal of DX pedition. Of course we realise, that time to time sudden QRM or QSB prevents the other party from successfully copying the end of the QSO and dupe QSOs can happen later. But for some reason this happens to you 6-7 times more often than to the majority of other HAMs who has 0 or 1 dupe QSO in our log. And also timeliness of online log uploads has nothing to do with you calling us when we call "CQ JA/AS", which you don't mention in your email at all. IK0OPS - if you read this, can you explain what forces you to make 7 dupe QSOs with 3C1L (already), 6 with 3C0L? And it's not just us. You made 11 dupe QSOs with 5T5OK, and 7 with A25UK as well, for example. Why? We could have spend this time giving someone ATNO (All Time New One) or new band. And it's not that someone abused your call. Because if we search your log on Clublog we can see that you think that you made even more QSOs with us. 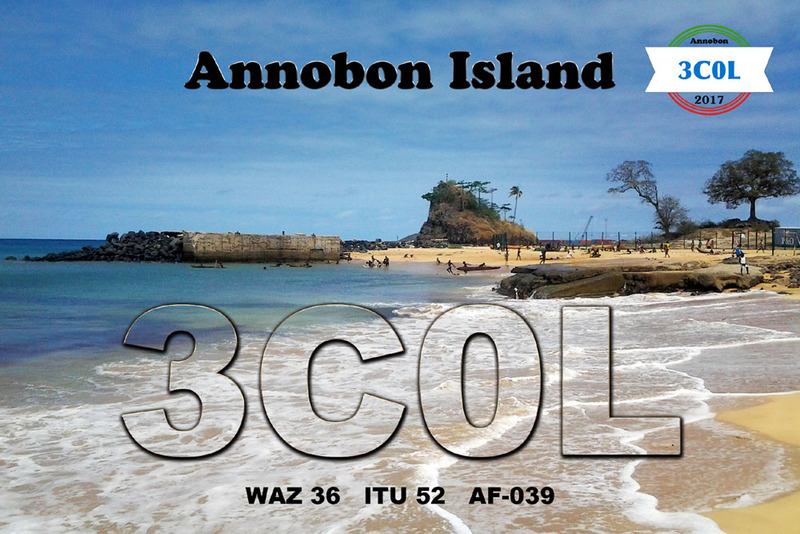 Some QSOs of October 9-10 were not uploaded to 3C1L Clublog yet. One separate file wasn't copied and uploaded. It will be done later, hopefully this Thursday. 3C1L operation will end (QRT) on November 12 morning (local time, which is GMT+1). Flight home is scheduled for early morning of November 13. Power cut again. Fuel is over. Turns out hotel owner has not brought more fuel for generator. Whole hotel is in darkness, including bar, refrigerators, A/Cs. That probably means that tonight we can get some sleep. Just had another power cut. Now 220V is back, but Kaspars says that not much fuel is left in generator. Hopefully this will not ruin the 160m sunrise session just promised. 56 JAs, few UA0s, UK, 9M6, HL in the log on topband this evening. So no - rate was not 0 as some anonymous "braveheart" spotted. It was around 60 QSOs per hour. At some point Kaspars sent SMS saying that all JAs are packed on one frequency and asked to spread out to make copying easier. He promises to be back on topband for everyone from 03:00 to 05:00 GMT tonight (before his sunrise). Electricity is being cut around each sunrise. They will try to negotiate to change this to few hours later. 100 more JAs in the log on 80m this evening + some UA9's/UA0's and HLs. Kaspars says there is less QRN today. Thanks to European operators who were patient (with few exceptions listed). You will have your chance. Yuris is running SSB pile-up on 20m. Good news. 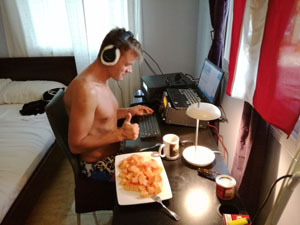 Yuris finally settled issues in Malabo and is on his way back to QTH in Luba with 2nd K3 transceiver, coffee and cigarettes. So we can expect 2 signals on the air soon. And may be SSB again, and even RTTY. Because Kaspars = "CW machine gun", Yuris = SSB/RTTY/CW. Kaspars reply to SMS with request to listen for Oceania on 20m: I have tried numerous times. But European HAMs are misbehaving and calling on top of areas I am trying to listen for. Guys in Europe and elsewhere. Please listen for operator instructions and obey them! If 3C1L calls for specific area (VK/ZL/JA/NA/Asia e.t.c.) and you are in other part of the world, stop calling! Some areas, like Asia and Oceania have short propagation windows to 3C. Europe has much longer openings and shorter path to 3C. So please respect your fellow HAMs in other parts of the world and stop calling when 3C1L is calling for areas outside Europe. Please behave as one might expect from "civilized Europeans". Those who will misbehave could find themselves in the blacklist with no chances to get QSL. As a side note, it is quite hard to satisfy all world area requests for being on specific bands on specific time with one station on the air and, as of now, single operator. Also if you will check in Google Earth software then you will find that 3C1L QTH is facing the ocean in the North West - North direction (Europe and North America). But there are quite high mountains (volcanos) covering directions East-South-West. This is another advantage for EU/NA, besides shorter path and wider propagation windows. 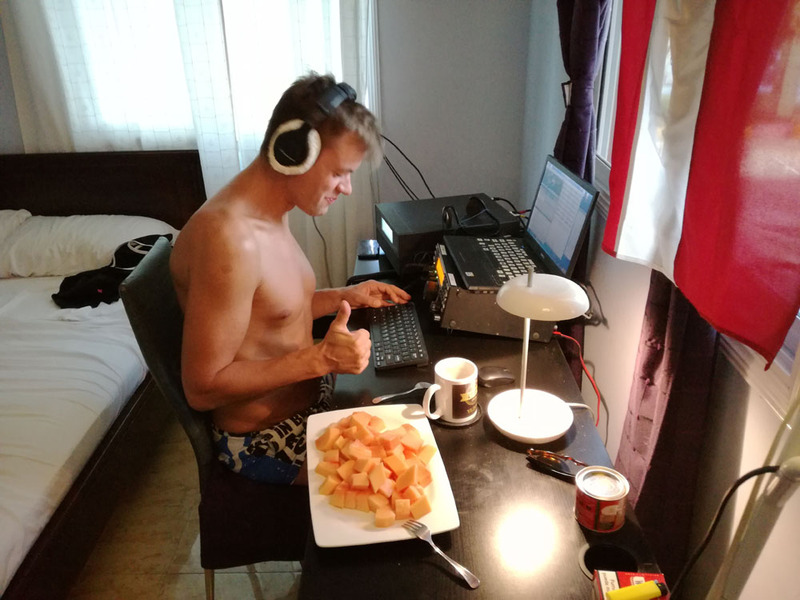 Kaspars comment on less activity last night: had a bit of sleep, then lost electricity, also food, coffee, cigarettes and local cash is over - have to go to the village to solve this. Around 15 000 QSOs in 3C1L log. Kaspars is still alone in QTH (3rd day in a row). Was buried by CWT mini-test on 20m. Will take an hour nap to not fall asleep under the table at night. Yuris stays another night in Malabo - still no success with visas and K3, just promises. Earlier Kaspars told that each evening they have nearby thunderstorms causing QRN, then rain during the night, and sun in the morning. On 160m QRN crackles approximately until 0100Z. 66 JAs logged on 80m. Plus UA9's/UA0's. And again zoo on the frequency in Europe. Yuris will stay one more night in Malabo. His efforts today to settle K3 and visa questions failed again. Some stats from 3C0L log. 1351 dupes in the log which is 4% of total QSO count. Not so bad compared to S21ZED/S21ZEE DX-pedition in spring this year when dupe percentage was 16% - 4 times as much. Even taking into account that in Bangladesh team was using 2 different callsigns and dupes were counted after merging these logs into one, still it is at least 2 times less dupes for 3C0L than for Bangladesh DX-pedition. Not sure what changed. No Clublog upload for 3C0L during the operation - should influence in the opposite direction. Threats to not send QSL if more than 2 QSOs made per band/mode slot helped? Hard to believe that HAMs got better behaved :) Or may be Yuris/Kaspars more often replies with "QSO B4" instead of silently logging dupes (they mostly use single laptop here, versus several parallel laptops in Bangladesh without log sync). Anyway 1351 dupes is almost half day operation just for dupes. Unfortunately Clublog uploads were not possible to avoid some safety dupe QSOs. And also now due to problems with Internet they can not upload 3C1L log during the operation. At least not so far. More 3C0L statistics you can see in Clublog Expedition charts under Statistics tab. Still strong QRN on topband. Despite this 9 JAs logged on topband around their sunrise. The same time Europeans were entertained by DQRMers combined with "police". "Policemen" please understand that your efforts will not help to fight DQRMers. Just ignore them and don't add more QRM on the frequency. QRT date might be around November 8-10. To be decided soon. 3C0L log uploaded to Clublog. 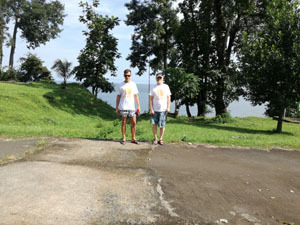 Last Friday we moved from Malabo to Luba, which is approximately 50 km away from Malabo. We found this hotel before leaving to Annobon. 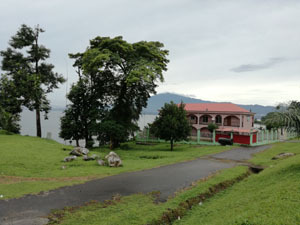 The hotel is located on the ocean's coast and it has autonomous power supply provided by 36 kW generator. After our adventures with electricity supply in Annobon this is like heaven. We finished installing Folding antenna on Friday evening in darkness and soon started to operate. 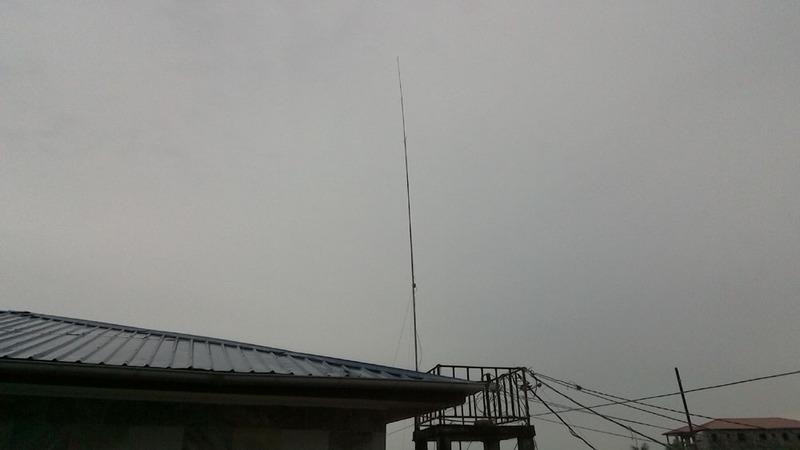 Next day also installed big vertical with RA6LBS matching unit and simple 30/20/15m bands vertical. The biggest problem is that near the hotels and guest houses there is no space for antennas. Or there is neighbour's land, or jungle, if it is on the edge of village or town. 18m high vertical we placed between trees and radials put as good as we could. On average we make around 3000 QSOs per day, because we work only with one transceiver. Last night we were on 160m, bet there was thunderstorm nearby and big QRN. The place for operation is very good. The hotel promises to provide Internet, but at the moment we don't have it. When we have it we will be able to regularly upload logs. 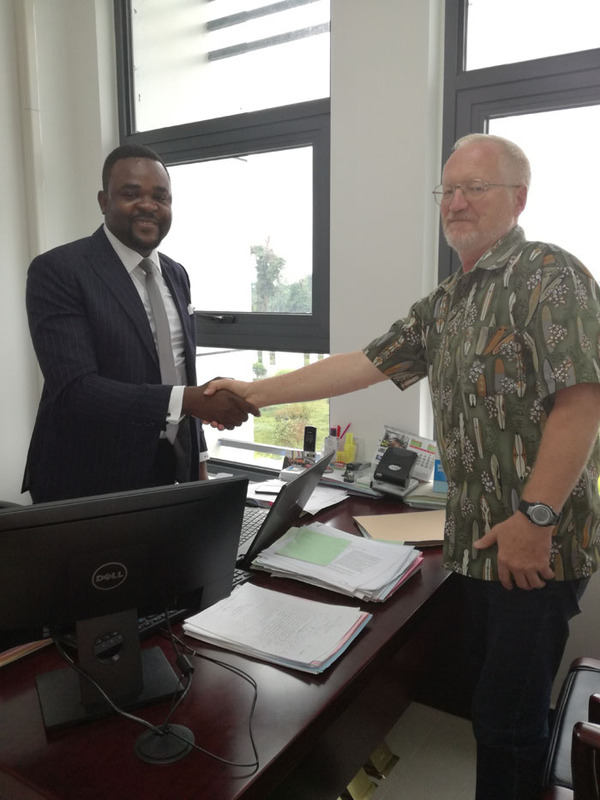 On Monday morning I went to Malabo, to get spare K3 from DHL through customs. We also need to prolong visa. During the day I didn't manage to settle these questions, because the responsible persons just are not in their workplace. So I have to stay in Malabo overnight and continue tomorrow. At the moment I can't say how long we will be on the air, because we have missed our flight home (23.Oct) and will have to buy new tickets. Heavy QRN from nearby thunderstorm. Crackles S9+20 dB each 3-4 seconds. That's why Kaspars moved from 160 to 80m. Not better QRN wise, but at least signals are a bit stronger. Otherwise nice lightning show above the sea. Reminder - don't make repeated QSOs on same band and mode. If you will make 3 or more QSOs per band/mode slot you will not receive any QSL. Big vertical is up and tuned for 160-30m bands (no 60m) with RA6LBS match-box. So they can transmit on all bands now. Right now operating on 10.1 MHz. Not more than one signal can be put on the air until Monday at least, when hopefully they will get 2nd K3 through customs. Tomorrow will set up the smaller vertical as 2nd antenna for some bands. Beverage receiving antennas are not installed. Not sure yet if will be at all. QRT for a while. Going to build low band antenna. Internet is promised to be fixed on Monday. SMS from Yuris: We are in new place. Folding antenna is up (covers 20m-10m bands), finished in darkness. 3C1L will be on the air soon with one signal. 2nd K3 is not yet in our hands. "Monday" again. Tomorrow will put up other antennas. The place is beautiful. Mains voltage is OK here, big generator in operation. Plans regarding 3C1L have changed. 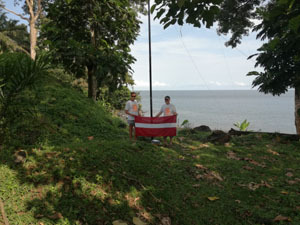 Yuris and Kaspars are in Malabo, Equatorial Guinea and Yuris says that they plan to continue as 3C1L. He is looking for proper QTH. But they are not QRV yet. It was pirate playing on the air earlier this evening on 80m band. The spare 2nd K3 has arrived, but has not yet passed customs. They still haven't managed to get to the Internet to upload the logs. Date of flying home is not known yet. Regarding K3s - those who posted negative comments on DX-Cluster about failing K3s, please bear in mind the conditions they were being operated at 3C0 (jumping mains voltage 120-180 V). If you dare to test transceiver, or even better - two of them - of your beloved brand in similar conditions for about 12 days, then lets compare the results. 3C0L is over. Yuris and Kaspars are in Annobon airport waiting for their departure back to Malabo. Will see what's up in Malabo, as they have missed their flight home which was scheduled for October 23rd. 30000 QSOs in the log. They went QRT around 05:30 GMT to pack the remaining antennas and other stuff. If flight will be postponed again, they will put back the small vertical and continue. They are QRV on 30m band using smaller vertical they set up earlier for 30, 20 and 15m bands. Flight from Annobon is postponed to "tomorrow". But big 18m high vertical is packed already. Only Folding antenna left in operation. It means team is not QRV anymore on lower bands. 27500 QSOs in the log. In the morning second K3 failed. Yuris managed to put it to life again. They will not activate anymore 3C1L this time. They will work from Annobon as 3C0L until they manage to leave the island and finish the operation with this. The flight is promised tomorrow. But when it will really happen, not sure. Flight to 3C1 on Tuesday is under question. We still have only one operational TRX. So we can not put 2 signals on the air the same time. Yesterday there was pirate operating on 30m band, today on 17 m band. 23000 QSOs in the log. Yesterday made around 800 QSOs on 10m band. Sun is frying, no water to wash. Minor rain on a night before yesterday. 17 000 QSOs in the log. Today upper bands opened. Around 800 QSOs in the log on 12 m band so far and 50 on 10m band. We are stuck on the island. Thus 3C0L operation is extended until October 23rd. Tickets for our return home flight became useless. Around 900 QSOs logged on 160m band tonight. In total around 10 000 QSOs in the log. Spare K3 is sent out from Latvia. Costs nearly half of human ticket. We are getting questions about the date of planned return to 3C1L. Yuris has not answered this question yet. He says that tickets are booked and that getting to Annobon was problematic. Getting back to Malabo (3C1L) will not be easier. Initial plan was to fly home to Latvia on October 23rd. That's all we know. Will update as soon as we know more. Yuris asks - please stop calling if you already have QSO in the log on the same band and mode. Those having 3 or more QSOs in the same band & mode slot will not receive QSL. Log will be uploaded in best case after return to Malabo. Power supply is fixed. K3 is not. Spare one will be sent, hopefully will arrive until 3C1L operation will resume. There are good and bad news. Bad news - joy with 2 simultaneous stations was short, yesterday one power supply and K3 failed. Good news - this morning they visited governor and got their passports back. During the night 1300 QSOs on 40m band were logged. In total around 8000 QSOs in the log. 6000 QSOs in the log. 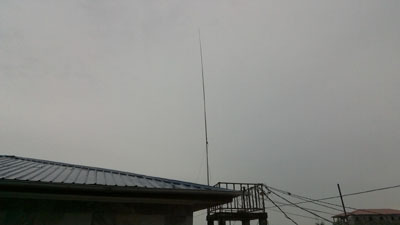 Additional vertical antenna for 20, 30, 15m bands is erected and 2nd generator is rented. So 2 simultaneous signals 100W each are possible on the air during day time. However the 2nd generator also generates solid noise. Not on the bands, but in real life. Doors are kept open because of heat (no A/C). 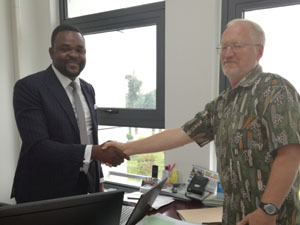 Like during our earlier DX-pedition to Bangladesh we will support local pupils in Annobon with first need aids. Yuris asks: Do not call us if you don't hear us! Around 4200 QSOs are in the log so far. Yesterday were focusing on 15m band. During the night they were active on 80m band, made 750 QSOs there. Had some minor issues with antenna. Then moved to 20m in the morning, now some 17m activity. Plan to be ready on Top-Band next night and also be ready for RTTY. Locals are very friendly and helpful. Everything is OK, except some minor sun burns got during antenna set-up and also problems with water supply. 12:40 GMT SMS from Yuris: Power generator failed. Were running on 15m band CW with 100 W. That was the maximum power that the generator could handle. In the evening after 6 PM (local time, which is GMT+1) hopefully will have mains voltage again. Good news - they got some tap water. Sun is frying. Friday 13th around 17:30 GMT 3C0L hit the airwaves on 14029 kHz. Yuris sent SMS saying that mains voltage varies between 130-180 V and transceiver switches off. This explains a bit messy first minutes (pauses, jumping to RX frequency and doing simplex for short time) and also explains distorted signal tone time to time. Thus, they can't run full power. Also as soon as they put up low band vertical some local approached and asked to pay. So low band antenna is not tuned. Meanwhile Kaspars will run on upper bands. Tomorrow will think what to do. First part of the DX-pedition's diary can be found here. It covers days up to October 8th. Regarding the current status - SMS from Yuris says that they are in Annobon. Their passports are taken away. Tomorrow is national holiday. Governor is not speaking with them. In the best case they might be on the air on Friday 13th. QTH is OK, but could be more space for antennas. From 6:00 to 18:00 there is no electricity. Also sounds like there they can't get to Internet. So Clublog uploads are under question. 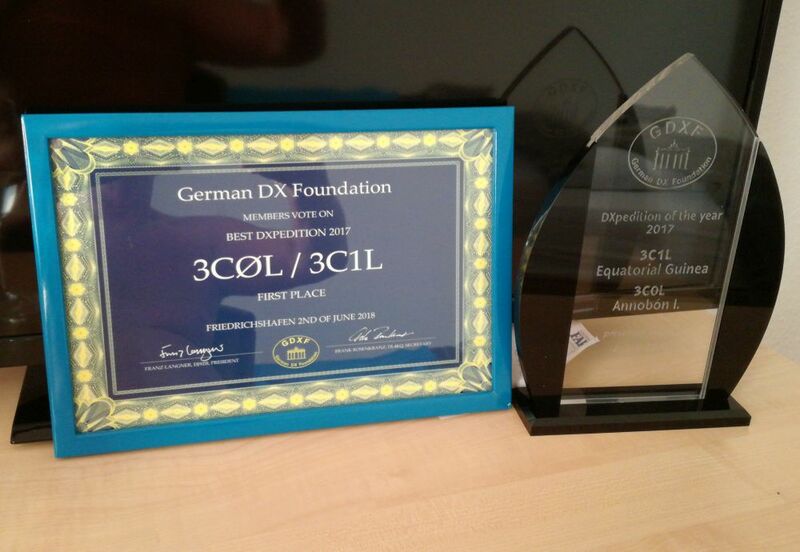 Finally licenses for 3C0L and 3C1L are successfully received. 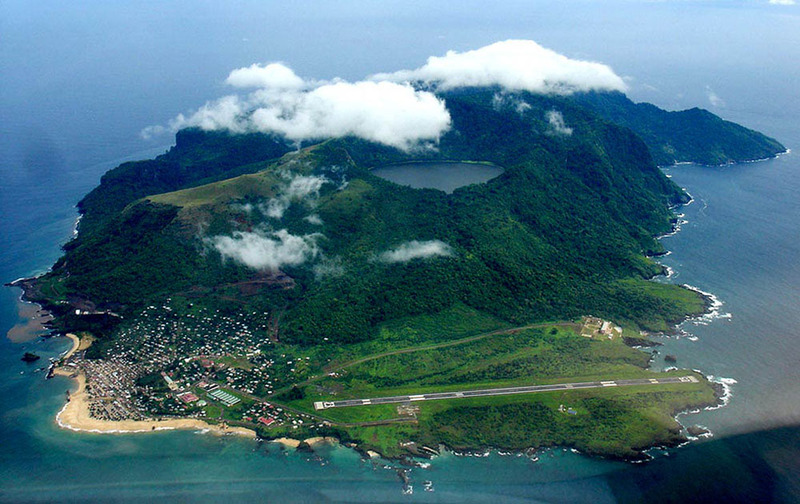 Yuris is looking if there are soon any flights to Annobon. If available they will start operations from there. License fees paid. But license... "Monday...". If on Monday license will be obtained and flight to 3C0 will be available, then will go to 3C0 on Tuesday and start from there. Meeting ended again with "Tomorrow...". In a mean time guys are looking for suitable place for QTH. In this city they say there is none. Tomorrow will go and look for it further away. Next available flight to 3C0 is promised to be on October 12. Yuris and Kaspars have successfully reached 3C. Today they had meeting with authorities to obtain the license. Tomorrow one more meeting is scheduled. Let's hope for positive news. Yuris/YL2GM - team leader of two successful past DX-peditions (EP2A, S21ZEE/S21ZED) - and Kaspars/YL3AIW in October 2017 plan to be on the air from Bioko island, Equatorial Guinea (prefix 3C, Clublog's most wanted #44 as of September 2017, IOTA AF-010) and Annobon (prefix 3C0, most wanted #30, IOTA AF-039). They will arrive to Equatorial Guinea in the evening of October 2nd. 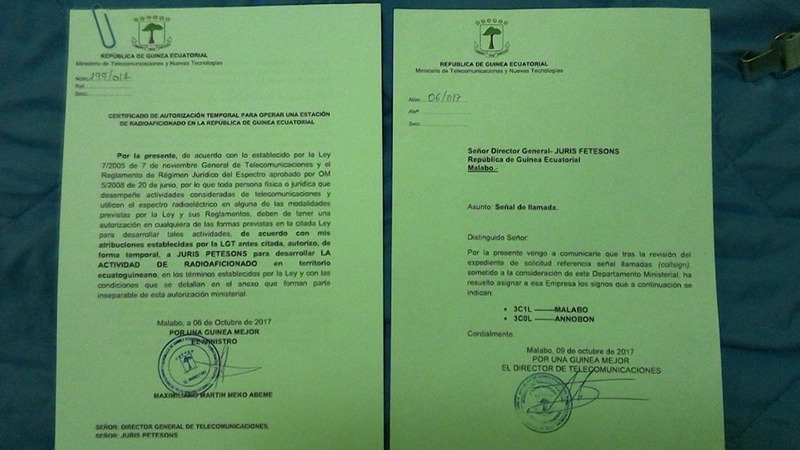 The next days they will deal with the formalities to obtain callsigns and license. Their flight back home is scheduled on October 23.